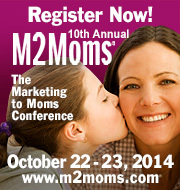 Did you miss Experian’s workshop Moms Rule, Marketers Drool: Insights for Capturing Mom’s Attention at M2Moms® 2013? Presenter Bill Tancer, General Manager of Global Research, Experian Marketing Services and author of Click… What Millions of People Do Online and Why It Matters, will reprise his well-rated M2Moms® workshop from October’s M2Moms® conference via a live webinar, Monday, January 20 at 1:00 pm ET. Through Experian’s exclusive market research and analysis, webinar attendees will learn to capture the attention of today’s always on, always connected Mom. Click here for a full description and to register.